The story of an artist suspected of being Jack the Ripper. 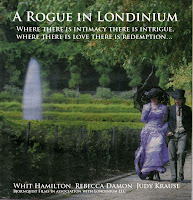 A Continuation of the story of Richard Rhys and Victoria Thornton from A Rogue in Londinium. Erotica, Art, History, Alchemy, qabalistic tree of life, Time Travel, Transmigration, ghosts, soul mates and true love. The Great White Storm that hit New York in 1888 was the worst blizzard in US history. 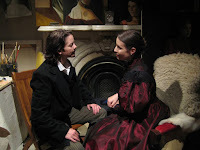 Richard Rhys newly married to Victoria Thornton leaves for an appointment with Edwin Booth on a spring morning in March. His wife has taken the landau to their Manor house in the Flatlands of Brooklyn. 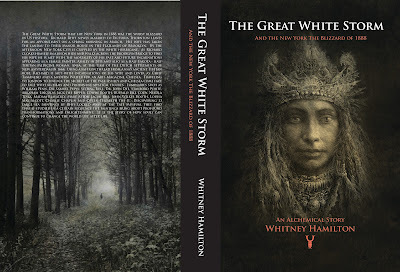 By the afternoon New York City is crippled by the white hurricane. As Richard cloaks himself in a bison hide and walks across the Brooklyn Bridge to find his wife he is met with the mortality of his past and future incarnations appearing as a female painter, Ashley in 2011 and also as a half Lakota - half Tibetan Medicine woman, Ansa, at the time of the Dutch settlements of New Amsterdam in 1664. Using a saffron thread from Ansa’s ancient Tibetan robe, Richard is met with incarnations of his wife and lover as Chief Tamanend and a modern Writer for an Arts Magazine, Chelsea. Traveling to London to unlock the secrets of the past, Ashley and Chelsea come face to face with alchemy and prominent mystical figures. Luminaries such as William Penn, Dr. Samuel Pepys, Sitting Bull, Dr. John Dee, Stanford White, Buffalo Bill Cody, Nichola Tesla, Madam Blavatsky, Mary Astor, Jacob Riis, Edwin Booth, Abraham Lincoln, Nichola Tesla, John Wilkes Booth, Jack the Ripper, Louisa May Alcott, Charlie Chaplin and Queen Elizabeth the II. Discovering 13 large sea paintings by Rhys locked away at the Tate Museum, they find that if studied in a certain sequence the paintings bring about profound transformations and enlightenment. A story of how a soul can continue to change the world life after life. The folks who are the brains behind A Rogue in Londinium have been in hibernation for these four months or so. But it is not because they are in need of rest, although I wouldn’t blame them. It is because they have been working silently and diligently on re-editing, re-sound designing, re-mixing and figuring out a way to succinctly tell the story in the least amount of time. After having spent time and money in festival fees, festivals and talk back screenings, Elizabeth, the director, decided that she needed to go back in and almost rewrite the entire film based on audience reaction and review. I asked her about this process that a lot of filmmakers employ in order to perfect and finish a project ripe for the market. True enough. Although I’ve only seen the film once thus far last October, I was certainly floored and impressed by the careful unfolding of the story. The one thing I did observe was that many people in the audience with the same reaction I had, felt like 10 to 15 minutes could be cut and the end tightened. It is a tough situation for anyone working on their own creation. 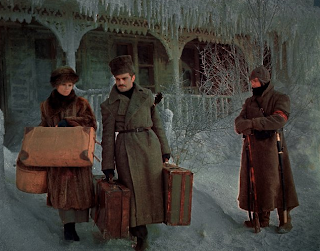 Because the film has such high production quality with lush sets, gorgeous costumes and brilliant lighting mirroring the impressionist period and the darkness of Victorian London, it is like deciding which paintings to keep in your art collection. I asked Elizabeth about this. Editing is an art unto itself. It is about subtraction. Directing is about addition. So the two disciplines work against each other and yet provide a finely distilled finished product…like good whiskey or a fine wine. Most directors work with good editors time and again. 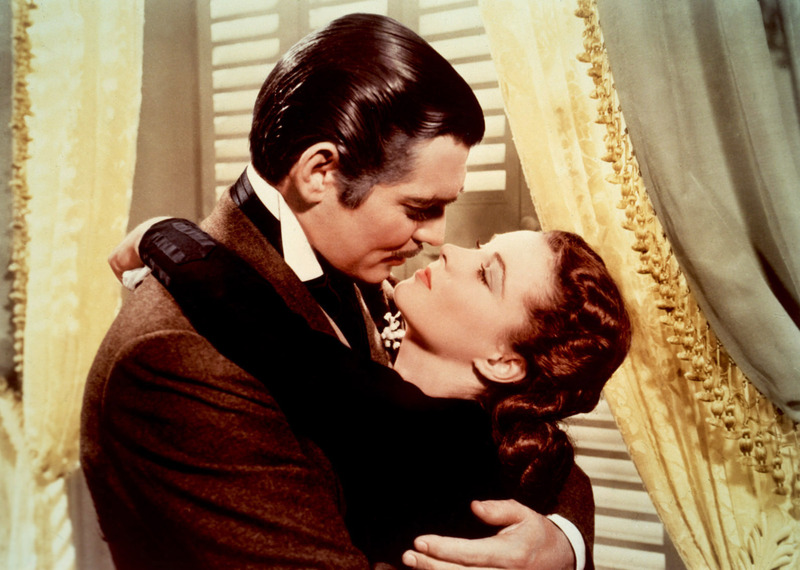 It is a dance—a marriage, and the two compliment each other well. Thelma Schoonmaker has worked on almost every Scorsese film, winning three academy awards for her work on Raging Bull, The Aviator and The Departed. Michael Kahn has a thirty year working relationship with Steven Spielberg winning three academy awards for his work on Schindler’s List, Raider’s of the Lost Ark and Saving Private Ryan. Walter Murch who has worked consistently with Francis Ford Coppola on The Conversation, Apocalypse Now and The Godfather(s) says that when he is editing he stands up like a conductor because it is active. However, when he is creating he lies down so that his brain views the tasks in a very different way. When the director of a film is also the editor that person can find themselves working against everything they’ve just invested years of money, time and energy creating. Working alone is like performing in a vacuum. And so objectivity comes from the outside. I asked Elizabeth how she was able to come to terms with cutting out precious parts of her film. “Time and distance are invaluable. I am independent…to the point of still being a guerilla filmmaker in a way. I have one thing that a lot of people don’t in this business and that is time. Since we are self-producing and privately financed I answer only to my partner and myself. There is no deadline, timeline or outside financiers breathing down my neck. That’s not to say I want to spend years on this. But there is no insane urgency to get the product finished and out into the market. I view these works in the very long-term. In today’s film world people must turn over a product and hit the market as quickly as possible in order to recoup the investment.” She tells me. “And so how did that effect your approach to Londinium?” I asked. So I asked if anyone has seen the current shorter version hinting that I’d like to see it myself. “So the big question is this: Why edit your own film?” I ask. “What’s the next project?” I ask. 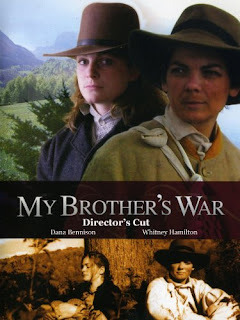 The re-edited version of My Brother’s War is available for digital rental on Amazon ($2.99). What Do Movies Really Mean? The Oscars are well over and all eyes are now focused on the Spring festivals like Tribeca and Cannes. 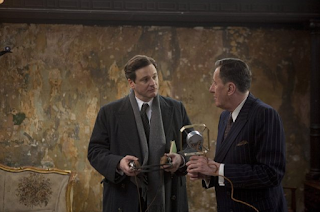 After watching the Oscars I was gratified to see The King’s Speech win. That and True Grit were my personal favorites. Afterwards I heard a lot of complaining about the show and in particular the gracious hosts. Firstly, the show has always had a comedian host with the likes of Billy Crystal, Whoopi Goldberg and Dave Letterman, certainly the cream of the crop in their field of entertainment. Anne Hathaway and James Franco are not comedians and so it is like comparing apples and oranges. Incidentally, I thought Hugh Jackman did an amazing job when he hosted it the year or two before. So rather than gripe about the hosts, I personally applaud them for their guts and courage to take on such a behemoth task knowing that they would be under the nation’s scrutiny to ‘make ‘em laugh’. The other thing that I noticed is that many of the winners thanked the unions. With all that is going on in Wisconsin, the cradle of all unions, I find it thought-provoking and pertinent. As Americans, and particularly recent generations being reared and almost overwhelmed by the choices of entertainment these days, we take for granted the hard work that goes into creating movies and episodic shows like Boardwalk Empire and Nurse Jackie as well as Network Television series. 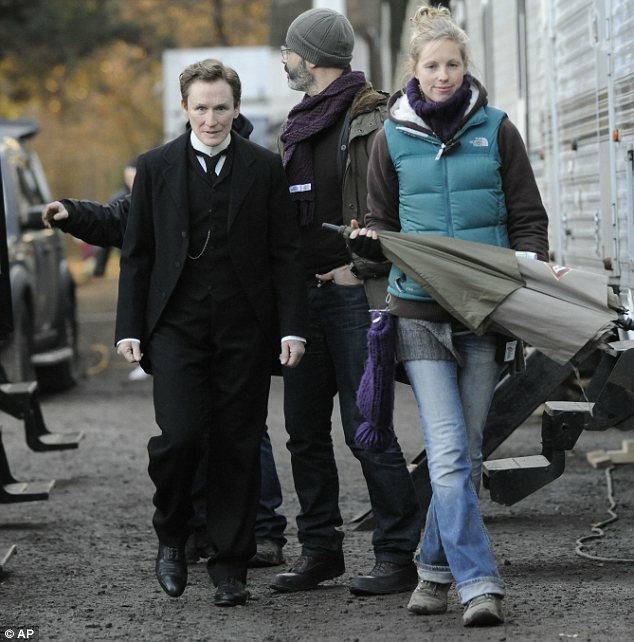 There are between fifty and one hundred people, more or less, working behind the scenes on any given project or show depending on the budget. These people are grips and technicians, make-up artists, location sound mixers, editors, day-player actors, craft people, set builders and dressers. Because the content is so readily available for a minimal price we don’t seem to value or consider the type of hard work and long hours that these people put in, in order to deliver a show or film on time. These people behind the scenes went to college or apprenticed for years to learn their craft to be good enough to be included in the union. And in return the union protects their interests and livelihood by creating a structure to work within: A fair day’s work, a fair day’s wages. And because the business of film and television production is so precarious, these people deserve to have healthcare and pensions just like the local police and firemen. The other thing that the union does is ensure quality and craftsmanship to the consumer. Which brings me back to Wisconsin and the union-busting that seems to be going on. Every other manufacturing field has outsourced to other countries for cheaper wages and no rules on workdays, hours or healthcare. The car companies, i.e. Ford, part of GM and Chrysler are the last vestiges of ‘Made in America’, but they are barely staying alive (with a bailout). Foreign cars made here in the United States operate outside of union control like the Mercedes and Hyundai plants in Alabama. Any household appliance on the market is almost always surely to be manufactured in another country and computers and clothing have completely vanished to China, Japan and India. There was an article recently about an Apple manufacturing plant in Beijing. Management had to put up netting around the building because many workers are so unfairly treated they would rather jump off the building to their deaths than to return to virtual enslavement. There had been several suicides in eighteen months. Apple has since intervened with Americans overseeing working conditions. This leads me to pose another question. What do movies mean? America is the birth of cinema. Sure the Lumiere brothers created the first cameras and actualities but it was D.W. Griffith who told a story through the new innovation. And this new form of entertainment helped get us through World War I and ever more importantly World War II, Korea, Vietnam and Iraq, reflecting back to us what we as a culture were/are experiencing. It is a barometer for social change and evolution. Not just during war but during the good times, too. These people are the dreammakers, wizards and magicians. They give us permission to leave reality and to engage our imagination. Sometimes with poignant reflection and other times with amazing and fantastic yarns. These are the people that gave us such masterpieces as Citizen Kane, The Wizard of Oz, Gone With the Wind, Ben Hur, The Ten Commandments, The Godfather, Inherit the Wind, To Kill A Mockingbird, Gettysburg, The Bridge over the River Kwai, They Shoot Horses Don’t They, Ordinary People, and 2001, a Space Odyssey. Not only do these positions behind the scenes deliver us magical distraction from our mundane worlds, but they are also a cog in the nation’s economy. Then there is the argument that Independent film (Truly Independent film, that is, operating far from the studios and large investors) will provide the content. 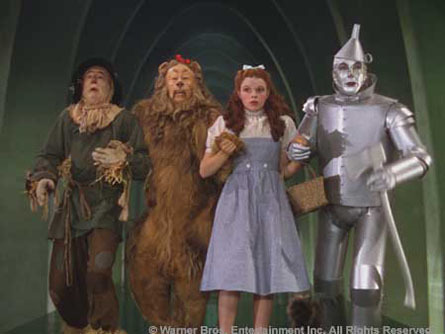 If this is true will we see the majesty of another Wizard of Oz, Lord of the Rings or Harry Potter? or the breathtaking cinematic experience of 2001, A Space Odyssey? Perhaps in animation only by a brilliant kid living in his parent’s basement painstakingly animating for years on a computer. Film is a social medium. It is our own conscience and requires a village to create. 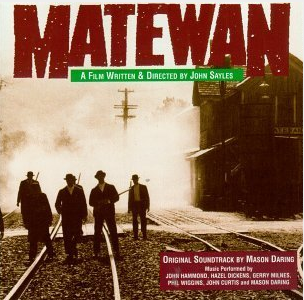 Look at Norma Rae or Matewan. We cannot go back. The good ole' days weren't that good. Ask your grama. I.A.T.S.E. was formed in 1893 to ensure the livelihoods of technicians, artisans and craftspeople devoted to theatre and film production. The Screen Actor’s Guild was created in 1933 in order to ensure the livelihoods of the people who dedicate their lives towards the craft of performance and to create humane working environments to the people locked into studio contracts at the time. The unions created child labor laws so that eight year olds do not work for twelve hours in factories. The unions created what we consider our weekends and our eight-hour shifts. The unions created safety regulations so that the tragedy of the Triangle Shirt Factory does not vanish from public consciousness. What amazes me is that people seem to resent the amount of money the unions require to do a job. Regardless as to whether someone works within a union or not each member of society needs to be able to earn a living in order to support themselves and their families and to create comfort in their later years. That is the American Dream. 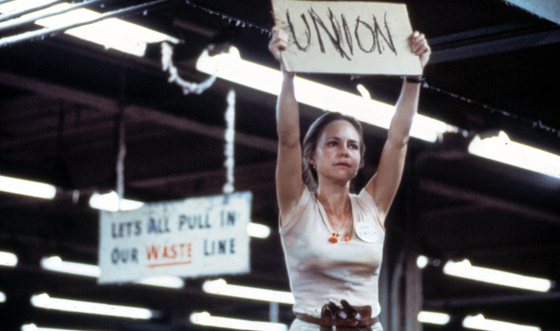 The union is one of the last forms of our country’s infrastructure---the working class. If the union goes then so goes a way of life that our parents, grandparents and great-grandparents worked so hard to achieve. It was not so long ago, about the turn of the last century, when the robber barons of the gilded age and the ultra wealthy conspired with corrupt law-makers to make it easier for them to get richer and neglect the common man. Theodore Roosevelt busted the monopolies and made it easier for competition as well as paving the way for organizing workers. We see ourselves looking at the same abyss once again with large corporations dictating policy and law-making to the detriment of its people. What does this have to do with movies? Once again, America is at the forefront of innovation and creative expression. If we outsource that valuable commodity sometimes called art, then where are we? Who are we as a culture? What do we really value and take pride in? I spoke with Elizabeth, the Director for A Rogue in Londinium and she said that she could not have made the same film without the union. “There is a certain pride and professionalism when working with union artists. That is not to say that non-union performers don’t provide the same professionalism. But I am guaranteed a level of quality.” She told me. “What will you do if the Governor of Wisconsin is successful in breaking the unions?” I ask. “I’m not sure. Everything I’ve worked for will have gone up in smoke. I still operate in the truly Independent world but my goals are to be working wholly within union jurisdiction at a professional level where I don’t have to take on freelance jobs to supplement my income.” She said. If you ask me it will most likely go to The King’s Speech. I predict that it will sweep the Academy Awards this year. And why not? Here we have extraordinary performances by both Colin Firth and Geoffrey Rush with outstanding supporting performances by Helena Bonham Carter and Guy Pierce. Did anyone recognize the doctor from Nurse Jackie (HBO)? She plays a fantastic, albeit, brief role as Wallace Simpson, the American divorcee that mesmerized a king and brought about the abdication of the British throne in 1934. Beyond the historical significance of the film, it tackles the often overlooked and misunderstood issue of stuttering. No doubt many people have christened this film as a champion for compassion and understanding in the arena of speech therapy and the intense isolation and disconnect that people with this impediment feel. The Black Swan is a cerebral and sophomoric, over-the-top film that I found myself bored within the hour. In the second hour I found myself laughing out loud. I don’t think that was Aronofsky’s intention, but if it is then, bravo! Not to take anything away from Natalie Portman. She fulfilled the part with great aplomb. But just like another actress from years ago who took on an over-the-top psycho role, Faye Dunaway’s performance in Mommy Dearest, I only hope that Natalie can side-step and overcome the repercussions of playing such a character. As you can tell I am not a fan of Black Swan and I will drink the proverbial cool-aid if it wins. The Fighter is a wonderfully ‘real’ film that truly mirrors a slice of culture that exists in today’s world. Mark Wahlberg is good and incredibly shrewd as a producer and businessman. The real nuanced performances are found in Melissa Leo as the mother. She represents a woman that is all too real even for moviegoers. Exiting the theatre, I heard people say things like, “Do people like that really exist?” “Those people were so hard and ugly. Is that what people from Massachusetts are really like?” Yes, and yes. The hard and ugly part comes from the lifestyle. Melissa Leo won both the Golden Globe and the SAG Award for her performance. Amy Adams does a great job as the girlfriend and plays against type. She is a surprise and a breath of fresh air. But the real accolades and the Oscar will most likely go to Christian Bale for his turn as a crack addict. Not that I hang out with crackheads, but living in New York City one is bound to come across a few now and again and Christian nailed it beyond belief. He has become one of those actors that goes to those places that no one else is brave enough to do. Inception was an amazing piece of cinema. At once cerebral and thought-provoking, yet thrilling and fast-moving. A smart story that makes one really ponder the idea of dreams and remote viewing. Leo’s performance delivers and so does Ellen Page, Joseph-Gordon Levitt and the incomparable Marion Cotillard. There was a film in the 80’s with Dennis Quaid that tackled the very same subject called “Dreamscape”. This movie takes the idea and multiplies it unto infinity. The effects and the writing alone should garner many accolades. I put my money on Visual Special Effects, Sound design and Editing for this one. 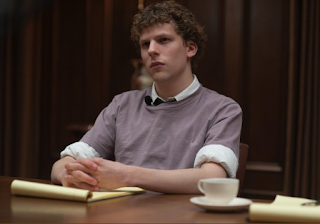 The Social Network is a film that tackles the birth of social networking and the backroom deals it took to make it a reality. Facebook users beware that the grand poobah of this new way of ‘community’ is tarnished in this semi-bio pic by Aaron Sorkin, best known for his brilliant work on The West Wing. In a recent 60- minutes interview, Sorkin said that he only loosely based his screenplay on Mark Zuckerberg, founder and bazzillionaire to the Facebook phenomenon. Making Zuckerberg, played potently by Jesse Eisenberg, an almost asberger’s type personality void of any real emotions ups the stakes in this courtroom drama. 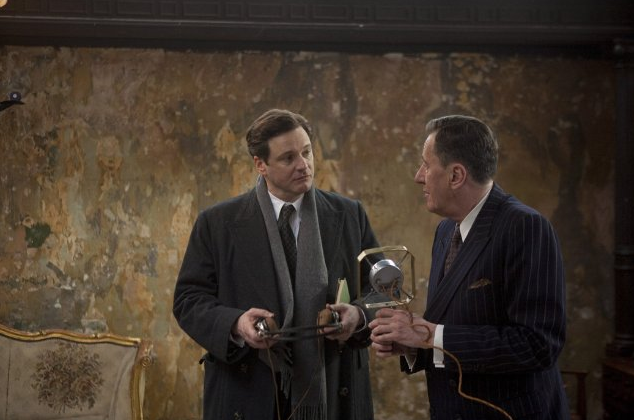 Wonderfully written and fantastically directed, it will certainly give The King’s Speech a run for its money. The Kids Are All Right is, perhaps, my personal favorite of the year. Not only is Annette Benning and Julianne Moore’s performances real and visceral, it is the most authentic family drama to come along in quite a while. The fact that the kids have two mommy’s is only a footnote to the situations and issues that all families face at some time or another. I put my money on Benning to win for Best Actress. Toy Story 3 is a wonderful animated feature that continues to deliver. A franchise that consistently proves that Pixar is the king of the Hill in its genre and domain. You can’t go wrong with Tom Hanks, Tim Allen and Walt Disney. Issues of abandonment are treated with care in this parable of love. Best Animated Feature and some technical awards is my bet. 127 Hours. James Franco stunned me with his brilliant and subtle performance as Sean Penn’s lover in “Milk” last year. This year he relives the nightmare of being pinned in a canyon miles from help and modern convenience. Portraying the life of Aron Ralston as he hiked a remote Utah Canyon alone and found himself trapped in the ‘narrows’. Unable to extricate himself, he took the brave challenge of cutting off his own arm in order to survive. At once a brilliant portrayal of man against nature as well as man against himself. The story becomes the ultimate resurrection of life over death. I have to be honest, I knew the true story and I was somewhat squeamish about watching a man cut off his arm but James Franco turns in a riveting performance reaching the realms of high art in this wonderful film directed by Danny Boyle of Slumdog Millionaire, winner of the 2009 Academy’s Best Picture. This will not win best picture but watch Franco as he climbs the academy’s political ladder. They will give him an award for both Milk and 127 hours for another film he does in the future. True Grit is, perhaps, the best western I’ve seen in a long time. A remake of the 1969 John Wayne classic, based on the book by Charles Portis. Up there with Stage Coach, Who Shot Liberty Valence, The Unforgiven and Dances with Wolves, this film introduces us to a fine young actress whom I hope steals the best supporting actress award. Hailee Steinfeld is outstanding. Kudos to Joel and Ethan Coen for adapting the script and brilliantly directing a coming of age and going of age with this tale of revenge that turns into redemption. The gripe I hear from theatergoers are that it is verbose, but being a fan of Deadwood when it was an HBO regular, I found the writing a kind of 'American Shakespeare'. People did not speak in contractions or abbreviations then, and so it seems odd to the modern ear. But believe me, the Coens are right on the money with this one. Finally, the Sundance darling of last year with a breakout performance by a previously unknown Jennifer Lawrence is a raw slice of life in fly-over country. Winter's Bone is set in rural Missouri and Arkansas, I wonder what people do to survive in hard times and this movie leads me to believe that people in dire straights will engage in illegal activity, especially if it only costs a few dollars to procure cold medicine from the local Walgreens or Walmart. Chasing the shadow of her meth maker father, a young girl tries to make sure she does not lose the farm to a jail bondsman and the law. John Hawks brings an amazing and frightening performance as her uncle who warns, threatens and then protects his niece from the other thugs dotting the countryside. It will not win, but as they say 'the nomination is what counts'. I want to address a huge problem that threatens indie filmmakers and that is piracy. People seem to think that if they can watch a movie for free then they have gotten something over on Hollywood. The fat salaries that big name stars and directors get are the justification to steal. But increasingly small independent films are being uploaded online even before they make it to market. Not only is it unfair but it robs the unknown actors, and crew of their livelihoods and future work. If content can be watched for free then cutting edge films and stories will vanish because they need the small amount of revenue that they actually make to continue making and telling stories of significance. I spoke with Elizabeth, the director of A Rogue in Londinium and she said that Londinium had been pirated from a film festival screener. Luckily, a swift and impassioned lawyer made the requisite threats in emails to the offending sites and the links have been taken down. However, like a multi-tentacled monster, these sites proliferate because people patronize them. VOD downloads only cost from $3 - $5 from legal sites like amazon and imdb. For the price of a Vente Latte from Starbucks anyone can watch these films AND support the people who make them. I ask the public to let their conscience be their guide. Support those who bring stories of significance and enrich our culture. Happy New Year! A week late. Over the holidays I was simultaneously busy with family and yet had a lot of free time on my hands since everything in the outside world slows to a crawl. I treated myself to True Grit. I am a fan of the original with John Wayne, Kim Darby and Glen Campbell and I was a bit tentative to see what the Coen Brothers came up with. I have to say I was prepped by the media blitz that the brothers decided to return to the source, a novel by Charles Portis. My first impression within the first ten minutes was how brilliant Hailee Steinfeld is as Mattie Ross, the teenage girl avenging the death of her father. She owned that character and as a result shines brightest in the entire film. I enjoy Jeff Bridges work immensely. That being said it is extremely hard to take on a part played so wonderfully by the Duke himself. Being a child of the late 70’s my only association with John Wayne was as Rooster Cogburn. It wasn’t until I became an adult with film appreciation that I discovered classics like Stage Coach, Rio Bravo and The Man Who Shot Liberty Valance. I was even older before I watched the WWII films that Wayne made. I digress. Jeff Bridges is a talented actor. He played the part well. Matt Damon, however, made La Beouf his own. The chemistry between Haille and Matt is wonderful. What struck me about this version is how simple and streamlined it is, a strong adaptation with minimal sets and impeccable acting work. Alas, the Western genre is alive and well. Thank you Joel and Ethan. The last five minutes of the film were also particularly memorable. It is the epilogue to the story and the adult Mattie returns to thank Mr. Cogburn. What struck me is the simplicity and beauty of the last moments. The adult Mattie looked like a real woman, not an actress in a western costume. Elizabeth Marvel, a staple of New York Theatre and alum of the Coen brothers, is striking. I had never seen her before and I was immediately struck by how memorable a countenance she has, not to mention the lush cinematography she is encapsulated in. The brothers are known for their quick wit and wonderful timing. One of my all time favorites is Oh Brother, Where Art Thou. They are masters of the timing of language and their humor is quite original. Raising Arizona is a classic. 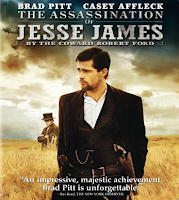 Another Western that truly impressed me is The Assassination of Jesse James by the Coward Robert Ford. It is an amazing film written and directed by Andrew Dominick. Beautifully photographed by the legendary Roger Deakins. With Brad Pitt as an unnerving and psychopathic Jesse James and Casey Affleck as the awkward hero-worshipping Bob Ford it runs just shy of three hours. There is a lot of tension, psychological ‘space’ and storytelling through the lush cinematography. 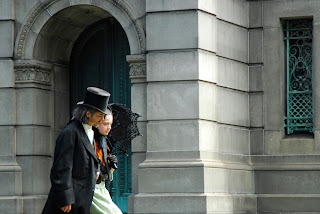 When I watched The Assassination of Jesse James I couldn’t take my eyes off the story. It makes me wonder if only studio made films can run that long. True Grit runs an hour and fifty. Both are fantastic stories in their genre and yet totally different in style. Although A Rogue in Londinium is not a western there are similarities in style to The Assassination of Jesse James…in that they both linger in scenes for the emotional effect. I have a feeling that The Assassination of Jesse James did far better in Europe and overseas than in the US because of its length and editing style. I want to mention an amazing western that became a sleeper. That is The Jack Bull (1999) with John Cusack. Every time I stumble upon it playing on a showtime or starz channel I stop what I’m doing and watch it again. Once again, the story is simple and succinct. One of the reasons I bring up the genre is that on a recent visit to check out the progress of Londinium and talk with Elizabeth, the director, is that a Western is on the agenda for Bjornquist Films. Very exciting. “How the hell are you going to pull off a western in this economic climate?” I asked her. “True.” I reply. They did. My Brother’s War. “If the story is strong and simple and takes place on the trail, then we have almost no sets, a few actors, a few horses and their wranglers and a crew. It can be done and done well. Every project we do we seem to evolve in the art and craft of it.” She said. And I know this to be true. “So what is happening with Londinium?” I ask. I ask her if she had seen the brief PR buzz around Glen Close’s project, Albert Nobbs, in which Glen’s character disguises herself as a man in Victorian Ireland in order to find work. 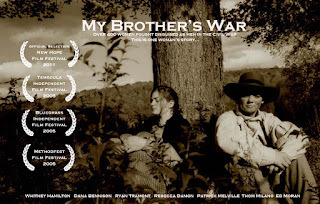 “Sounds awfully similar to My Brother’s War.” I say. Food for thought. I chew on it for a while and it keeps repeating on me. I have always considered my wife to be, if not my equal, then my superior in almost everything. “I read that Ms. Close has been trying to make this project for fifteen years.” I say. “Isn’t that a shame.” She replies. “That it takes that long to rally people to see the value in a well told story. It was proven onstage. That’s what happened with The King’s Speech. It was a play first and adapted for the screen. I wonder how long it took Tom Hooper and David Seidler to move it from stage to screen. I’m willing to bet a lot less time than fifteen years.” She says. “It only took you a little over two years to make A Rogue in Londinium. That’s a pretty big achievement.” I say. “Yes, but I had a lot of help from my partners Patrick Sullivan and Thom Milano. The cast and crew were beyond amazing. I don’t know the details of Ms. Close’s project but I can’t wait to see it when it is done.” She replies. “What do you see for the new year?” I ask. “A completely new way of approaching and working within the business.” She says. “In doing a few private screenings down south and here in New York the enthusiasm and excitement over Londinium continues to build. If I can keep steadily expanding my audience then DIY distribution on the DVD/VOD front could yield a profit come the Fall. “Are you planning on a theatrical run?” I ask. “I would love a theatrical run even if it rolls out for a week in a few art house theatres here in New York. We’ll see how it does and plan from there. I am realistic, though. I know that unless there are millions in marketing behind a film that the film’s audience will only be reachable through grassroots efforts like the internet and social media. That is my extended goal. To turn the unknown and undiscovered into a remarkable experience and well-loved piece of cinema.” She explains. 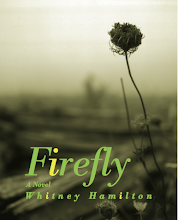 If you read Cold Mountain you'll enjoy Firefly. Now an EBook. I am a cinephile. I love everything about movies. Oldies, Foreign, experimental, classics, indies, animation, you name it. I am married with a 5 year old named Justin.